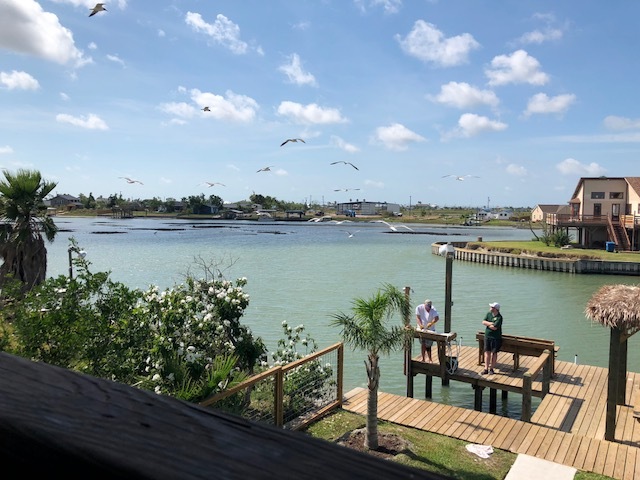 Great fishing from this beautiful 3 bedroom, 2 bath waterfront home located on channel between Copano Bay and Salt Lake! 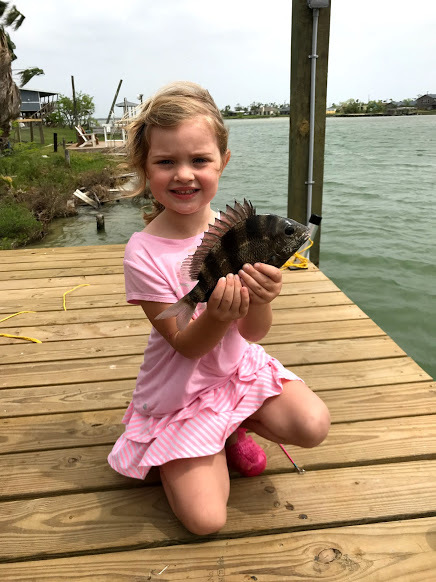 What makes a fishing vacation home perfect? Location, Location, Location...Imagine the ultimate Texas fishing vacation where you can relax and fish. 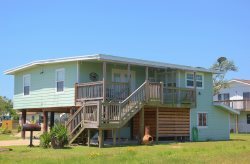 Coastal Oasis is a beautiful home located between Copano Bay and Salt Lake. Stretch out in your own private 3 bedroom bay front home. Enjoy spectacular views and breathtaking sunsets while relaxing on the dock's custom gazebo or top deck porch. 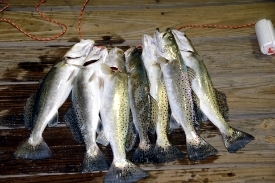 From the spacious dock you can fish for Speckled Trout, Redfish, Black Drum, Flounder, Sheepshead and many more. After catching your fish you can use the fish cleaning station on the dock. Since you will be fishing for hours there is a bench to sit and a gazebo with additional seating to allow your loved ones to enjoy with you. Its time to cook! Coastal Oasis provides a charcoal bbq grill for grilling or you can head to the huge kitchen that boasts of granite counter tops and fully equipped for cooking and serving your meals. The dining table seats 6 and there is more seating at the island bar. The kitchen is opened with the spacious living room where you can catch up on reading or watch the HD TV with access to premium packages including the sports channels. The home has WIFI High Speed internet for your convenience. The sleeping arrangements include a master bedroom with a king size bed and a private bathroom. THe second bedroom has a queen size bed and the third bedroom has a bunk bed with double size futon on the bottom and a twin on the top. These two rooms share a single Jacuzzi bathtub/shower and restroom. We are small dog friendly and have a partially fenced in yard that opens to the dock. EXCELLENT PLACE TO STAY...GOOD FISHING! My experience with Miss Kitty's was excellent from start to finish. There were many properties to choose from and the prices for comparable rentals on other sites (ex. airbnb & vrbo) were much more expensive than Miss Kitty's. Communication from start to finish was great. The best part was the house which exceeded every expectation. Perfect! The team is outstanding and has been for a long time. Always comfortable booking with Miss Kitty, there have never been any major surprises/disappointments. Coastal Oasis is a well planned property located in an EXCELLENT fishing area. We had a great time while we were there. The only hard part was having to leave and return to the daily grind. I am an avid fishermen that would be happy to recommend this property to all my fishing. Had a great experience working with everyone at Miss Kitty's. Very nice people. The property is awesome. Very well maintained and clean. I had several contacts with Brandi. She helped me decide which property would best suit your vacation needs. She also called to let me know that the entry code on the property had been changed and emailed the new code to me. She was friendly and helpful during both contacts. Our stay at Coastal Oasis was the perfect Spring Break getaway. It is beautiful inside and out. There was plenty of room for two couples and our teenagers. The men enjoyed fishing on the pier while we relaxed in the house or enjoyed the view from the balcony. We have stayed at other Miss Kitty properties, but this was the best yet. Had a great time - will come back again. The team was very good at communicating with us. We had no other issues that caused us to contact the team. We booked our stay way in advance because we had spent time at Casa Bella last summer and enjoyed it tremendously. Last year we spent tie at Pelican Point and enjoyed that too. Making arrangements for our stays is always easy with no complications. We will do it again in the future. Had a wonderful time and plan to be back. LOVED the house!!! Felt very safe - even during the big thunderstorm that was pounding against the house!!! Professional, quick responses to any questions we had. Miss Kitty's is top notch! Thoroughly enjoyed our week here. Very peaceful and relaxing. We did appreciate being able to bring our 2 small dogs with us on vacation. Beautiful setting on Salt Lake. Exceeded our expectations. Home was beautiful, kitchen was over stocked with everything you can update possibly need, and very clean.